Last week, I had the pleasure of being a guest of nurse bloggers Keith Carlson and Kevin Ross (or, as I refer to them, K²) on RNFM Radio. We spent a fast hour discussing the lifestyle of nurses, and The Adventures of Nurse Niki. I had a fabulous time, and one of the take-homes I went away with is the idea to hash tag forthcoming episodes of The Adventures of Nurse Niki on Twitter #NurseNiki, so regulars readers can discuss them on Twitter. Great idea, Kevin & Keith, thanks! Niki’s struggles are really no different than yours. She’s trying to find work-life balance and has the same inner turbulence that never seems to allow for the seat belt sign to be turned off. Niki’s hope was to work for awhile as a nurse and then be able to stay home with her daughter when she was born. She so desperately wants to feel that same connection with her husband that she had with him in college, but how can she possibly put her day in perspective for someone who isn’t exposed to the same emotional trauma that a nurse endures day in and day out? Sound familiar? Our well laid out plans rarely seem to work out in the way we picture them, and so far it certainly hasn’t for Niki as she deals with the conflict of the same characters we all try to play each day in our own lives. What we believe work-life balance should be is really what I like to call controlled chaos. With a house full of boys around here we often find ourselves having to put up barricades and call in the crowd control teams to herd what seems like a bunch of cats out the door for their next soccer practice or school performance. Just like many of us either currently or in the past, it’s never just a 12-hour shift and only 3 days a week. Nursing is not a part-time job by any stretch. When you work in high acuity settings like these it seems as if you never leave, even with a couple of days off in between your shifts. It’s really a constant you can depend on. Your co-workers become your family. The frightening difference is that they are the ones who understand you the best, and so the plot thickens. In case you missed it, The Adventures of Nurse Niki Chapter 16 posted last Thursday. I don’t want to spoil it for new readers, but this is a chapter you’ve waited for. 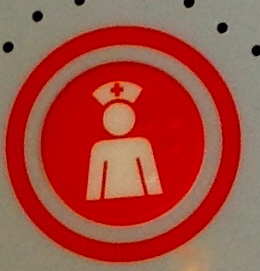 If you haven’t discovered The Adventures of Nurse Niki, the blog is formatted with the most recent episodes first. However, you can conveniently begin at Chapter One by clicking here. Previous episodes are also archived by month on the main menu. Don’t forget to Like The Adventures of Nurse Niki on Facebook, and follow her on Twitter @NurseNikiAdven #NurseNiki. Let’s do this! This entry was posted in Interviews of Me, Nursing Lifestyles, Pediatric Intensive Care Nursing, Posts About Art & Nursing, The Adventures of Nurse Niki, You Can Find Me Here Too and tagged Adventures of Nurse Niki, Digital Doorway, Facebook, Innovative Nurse, Intensive-care unit, Keith Carlson, Kevin Ross, Niki, nurse bloggers, nurses, nursing, Pediatric intensive-care unit, RNFMradio, The Adventures of Nurse Niki, Twitter, work-life balance by jparadisirn. Bookmark the permalink.